NVIDIA looks to be setting up for a few Black Friday deals of their own, two gaming packages to be specific, which could save you quite a bit of cash up front if you take mobile gaming very seriously. For a limited time, beginning November 28 at 12:01am and ending the same day at 11:59pm, customers can pick up a SHIELD Tablet “Green Box” bundle (includes SHIELD Controller) for just $399, or a SHIELD Portable with carrying case and replacement Armor for just $199. Savings on the Tablet bundle is listed at about $88, with savings on the Portable listed at about $60. 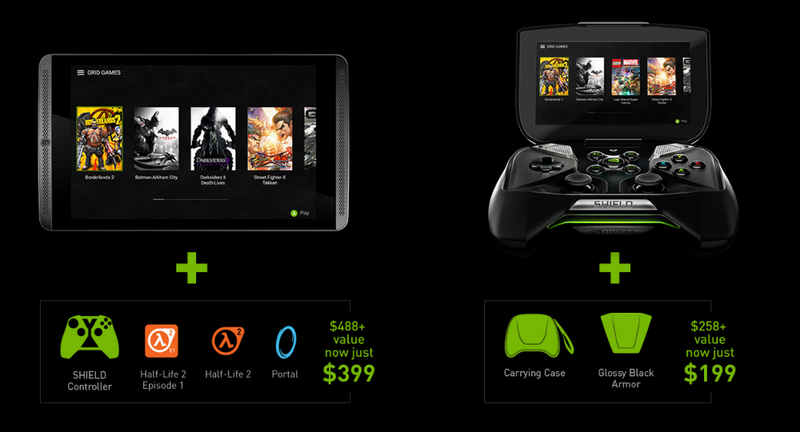 Of course, NVIDIA has its own value backed into the tablet, mainly being access to the GRID Gaming Service. For me, if I had to choose between the Nexus 9 and SHIELD Tablet, I would go ahead with SHIELD, simply for access to all of these sweet PC titles which is included. Located on NVIDIA’s servers are titles such as Borderlands 2, Batman Arkham City, GRID 2, LEGO Marvel Super Heroes, and lots more. As more Black Friday deals pop up, we shall inform you.